One of the authors, Jason Leopold, has quite the history when it comes to bad reporting. Most folks know of his claim that multiple sources told him Karl Rove was going to be indicted in 2006 and how it turned out to be utterly false. But, as Columbia Journalism Review noted back then, it wasn’t his first problem with facts. That is pretty big. But, like always in cases like this, there is more. Leopold, Cormier, and BuzzFeed’s editors are obviously keenly aware of the magnitude of the charge here. 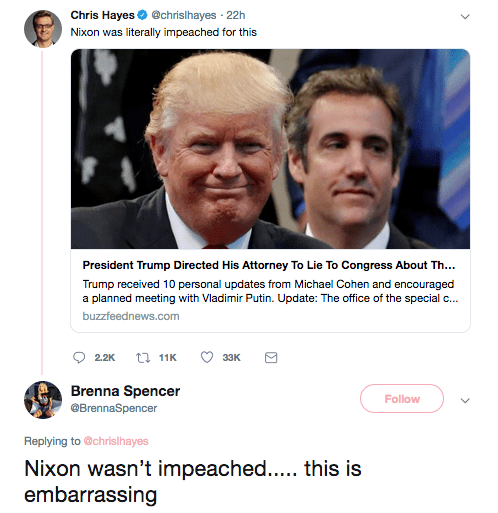 They’re accusing a sitting president of a crime that makes his removal from office conceivable, even with a Republican majority in the Senate. They also must be aware that we’ll know whether they were right or wrong sooner rather than later. This charge won’t hang out there forever unresolved, like Michael Cohen’s alleged trip to Prague per the Steele dossier. 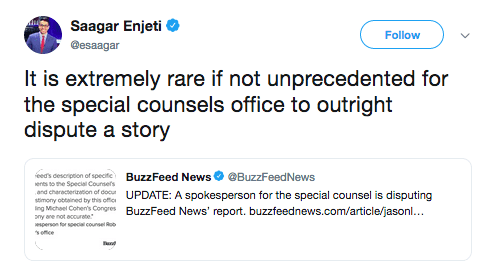 Mueller’s working on his report, it may be ready as soon as next month, and this claim — if true — will be a key part of it. 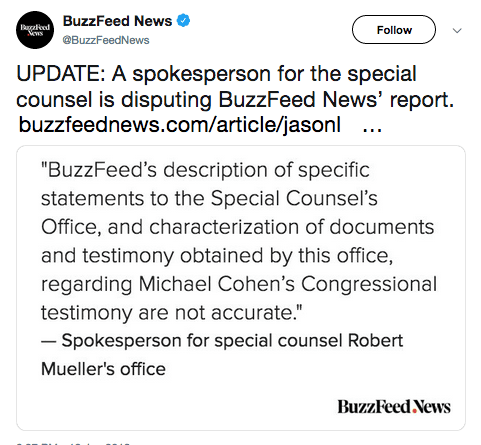 If the report emerges and there’s nothing in there about suborning perjury, BuzzFeed’s reputation will never recover. 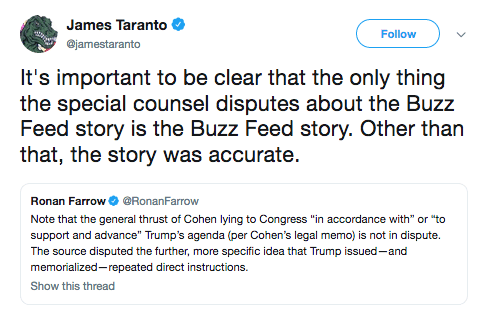 This isn’t a case like the dossier where they’re publishing someone else’s work product with no claims as to its veracity. They’re putting their own names to it. Every political scoop they publish for the next 20 years will be challenged by citing to the Leopold/Cormier fiasco. It’s basically professional suicide unless they really do have good reason to be confident in the reporting. And so maybe they do. We’ll know soon! 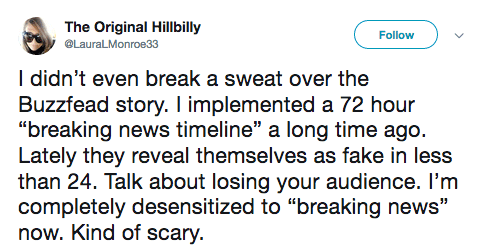 In addition to his Freudian slip about BuzzFeed itself, that’s a pretty nasty (albeit likely unintentional) subtweet from Smith aimed at former BuzzFeed staffer Andrew Kaczynski, who has since taken his habit of “resurfacing” old news to Time-Warner-CNN-HBO. 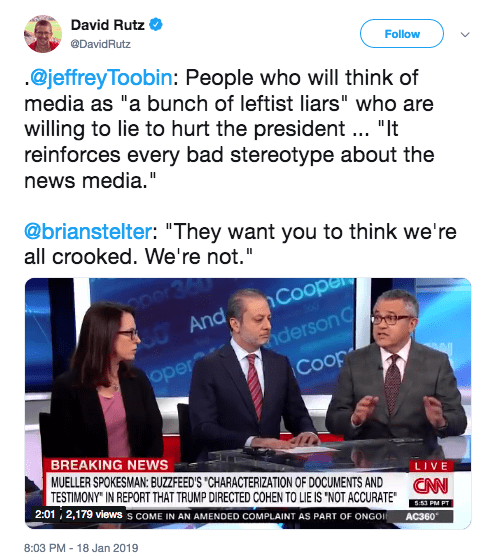 ANOTHER UPDATE: Shep Smith and Chris Wallace: Why haven’t any media outlets been able to corroborate BuzzFeed’s Trump story? Why, indeed? In two successive days, Trump’s owned Pelosi and the press, without even breaking a sweat. Welcome to 2019!